In 1912, the university adopted its present name. At the end of the 20th century, the Chinese government put Peking University at the top of its agenda for promoting higher education, with the aim to build a world-class university in the 21st Century. After merging with Beijing Medical University in 2000, Peking University once again was strengthened in its disciplinary structure. 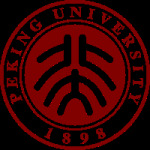 Peking University has continually played the essential role of pioneers in the course of China's modernization. The university's traditional emphasis on patriotism, progress, democracy, and science, together with its educational standards of diligence, precision, factualism, and innovation, have been passed down from generation to generation.